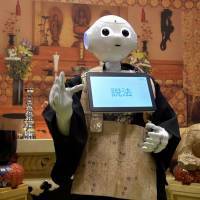 From a sutra-chanting humanoid robot to automated cemeteries, technological innovation is changing how Japanese deal with funerary rituals. As traditional family ties erode, people are opting for more affordable and convenient alternatives to conventional ceremonies and burial services. Various factors are behind the ongoing transformation of the funeral business, but demographics lie at its core. Japan’s low birthrate has diminished the size of family units while the aging population has given rise to elderly single-person households. Depopulation is hitting rural communities especially hard. Nearly half of Japan’s towns will disappear in the coming decades, according to one oft-cited report issued by the Japan Policy Council think tank. At the same time, rural-to-urban migration has resulted in an influx of residents to large cities — particularly Tokyo. The capital alone accounts for over 10 percent of Japan’s entire population. Sweeping demographic change is eroding traditional family support systems and forcing various sectors to adapt. The funeral industry is no exception. Ninety percent of funerals in Japan are Buddhist ceremonies, and Buddhist temples and priests have traditionally played a central role in caring for the dead. As pillars of communities, temples have historically relied on the danka system, where parishioners provide financial support to family temples in exchange for various religious services. But now many temples in dwindling communities don’t have enough local patrons to maintain its activities or upkeep. Funerals are also pricey, costing about ¥2 million on average. Burial plots can be expensive as well, especially in crowded cities like Tokyo. What’s the size of the funeral business market? According to Yano Research Institute, the overall funeral industry logged around ¥1.7 trillion in revenue in 2013. In a report, the institute said the sector is experiencing growing competition among an increasing number of players due to the relative ease of entry and lack of legal regulations. Companies from a diverse range of industries are jumping into the market, now estimated at roughly 16,000 operators nationwide. Demand for funeral services is expected to continue rising. The annual number of deaths in Japan is expected to reach 1.43 million in 2020 and 1.53 million in 2025, according to the National Institute of Population and Social Security Research. What technology is being put to work in the industry? Kusumi’s temple is listed on Mytera, a website dedicated to introducing temples, priests and the types of services available to people unaccustomed to Buddhist rituals. “Many temples can no longer rely on the danka system, but there’s still much demand for the religious services they provide. The internet can be used to match such needs,” said Etsuro Ide, a former business consultant who runs the website. Ide and Kusumi were participating in the Life Ending Industry Expo, an annual event held in Tokyo that showcases the latest products and services of hundreds of funeral-related businesses. Reflecting the strong interest in the sector, over 25,000 visitors attended this year’s three-day event held from Aug. 23. That was about 3,000 more visitors than the previous year. 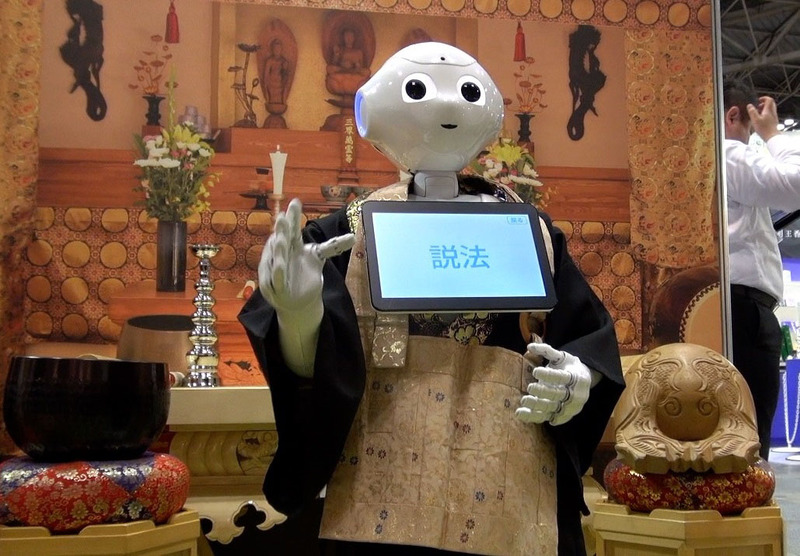 One of the highlights of the expo was a demonstration by Pepper, the humanoid robot produced by SoftBank Group Corp.
Nissei Eco Co., a maker of molded plastic parts, dressed Pepper in a Buddhist priest’s robe and programmed the robot to recite sutras. The firm, which has also been in the funeral business since 2000, said it plans to charge around ¥50,000 for Pepper’s services. The company also plans to offer live-streaming of funerals for mourners who are not physically able to bid farewell in person. Oki Seki Co., which makes gravestones, promoted a smartphone navigation app that provide precise directions to grave sites. Visitors to Fantechs Corp.’s booth wore virtual reality headsets to experience funeral services that incorporate projection mapping. How will technology change burial practices? Nearly 100 percent of the deceased in Japan are cremated. Typically, the cremains would be put in an urn and stored in the family tomb. But the ongoing migration from the countryside to metropolises means people are less likely to live near ancestral graves and are inclined to look for more convenient options. Burial plots, however, can be expensive in large cities. This has led to an increase in IT-powered multitiered vaults that can store thousands of urns for a reasonable fee. Tokyo Gobyo, a five-story facility in Tokyo run by Komyoji, a Buddhist temple headquartered in Gifu Prefecture, can store the remains of around 7,000 people. Mourners can pay their respects by passing identification cards over a touch panel in mourning booths, which then activates a retrieval system that locates the correct urns and mounts them on altars. The cost includes an initial deposit ranging from ¥500,000 to ¥1 million depending on urn space, plus ¥10,000 annually for maintenance and management. That’s roughly one-third of the price compared with buying a burial plot and tombstone in Tokyo. By all indications, yes. Like any other sector disrupted by technology, the funeral industry is embracing emerging tech trends and introducing new memorial service tools. Amazon.com Inc. made headlines last year when it partnered with a local startup to dispatch Buddhist priests to people who no longer have local temples to turn to for religious occasions. The rapidly aging population has also prompted funeral parlors to offer diverse services catered to seniors. Nagano-based funeral home operator Kankon Sousai Aichi Group is building a new funeral parlor that enables drive-thru services so those who have trouble standing can pay their respects to the deceased from the comfort of their cars. “We’re just trying to cater to people’s needs,” said Masao Ogiwara, the president of the company.